Thank you for the photo course at the lakes. Despite the bad weather, I went home with new knowledge. Must admit that I now have great respect for landscape photographers. It is far from as easy as I thought. Have been so caught up in my wildlife photography and the challenge of moving objects. Thanks again for a good introduction to photo workshops. I will definitely join more of them and try more landscape photography. No need to create an account with us, simply choose to reply with your social media account. If you wish to attach a picture to your comment, you must click on the 'IP' icon. You can attach a picture to your comment if you wish. Make sure the maximum file size is 200kb and 600 pixels on the long side. 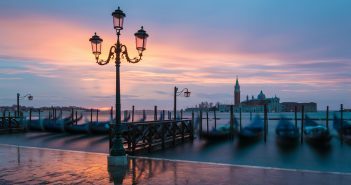 City of Masks, City of Canals, City of Bridges – the birthplace of Marco Polo and Antonio Vivaldi. 118 islands, more than 400 bridges, over 150 canals – welcome to Venice, Queen of the Adriatic.